The two hundred miles I walked from Chicago to Springfield with my dear friends from Fair Economy Illinois have special meaning to me. We marched fifteen days to demand a budget for our state that puts people and planet first. Throughout this beautiful and grueling journey, I carried a wooden cross in memory of my cousin, Elijah Murphy Jr.
Elijah was a father of four and the light of his family. Early one morning last November, on his way to work in Chicago’s Back of the Yards, he was shot to death in front of his eldest daughter. 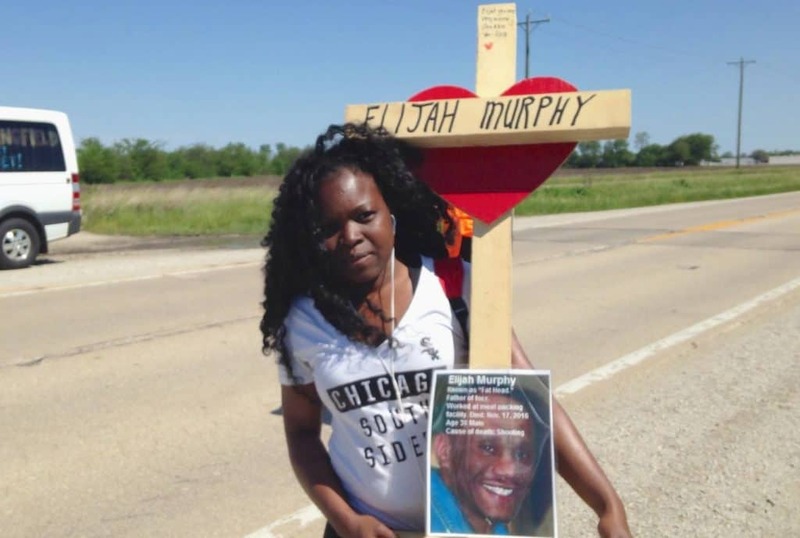 I carried Elijah’s cross because I know his life – and the lives of the nearly 800 loved ones we lost in Chicago to gun violence last year – could have been saved. And the first step to saving lives is for our elected officials to step up, do their jobs and provide our communities with the resources they need. Illinois is now entering its third year with no state budget. As my fellow marcher Martese Chism shared on Day 1 of our journey, the human cost of this crisis is staggering. The gun violence in Chicago that claimed my cousin’s life, and the lives of two of Martese’s loved ones in 2016, was the deadliest we’ve seen in nineteen years. Intensifying suffering from decades of austerity and cutbacks, nearly half of all human service agencies across our state have had to cut the number of people they serve. Hundreds of thousands, if not millions, of our citizens have lost access to critical services that help them put food on the table, find shelter at night, receive mental health care, addiction treatment, and sexual assault survivor and prevention services, and provide care for our children, our seniors, and our most vulnerable. People know our state is in crisis. 37,508 people moved away from Illinois last year, the most residents lost by any state and our third consecutive year of population decline. Illinois’ state bonds are also now just one step above junk status, an unprecedented low for any state in U.S. history. As legislators enter overtime before the new fiscal year begins July 1, they may pass a “grand bargain” budget they claim is better than nothing – but it’s yet another raw deal for working people. What kind of bargain raises taxes on working people – who already pay some of the highest taxes in one of the most regressive tax systems in the country – while two-thirds of Illinois corporations continue to pay nothing in state income tax? What kind of bargain cuts funding for schools, higher education, and the social safety net while continuing to protect tax breaks for the rich? Year after year, as we’ve lost our loved ones to this crisis – to violence, suicide, untreated disease, and despair – elected officials on both sides of the aisle maintain that the only way forward is to make deeper cuts. We are sick and tired of these lies. Illinois is so far from broke that just three straightforward changes to make corporations and the ultra-wealthy pay their fair share would generate $23.5 billion for the state. That’s enough to provide universal healthcare, repair our infrastructure, increase our investment in pensions, create hundreds of thousands of new jobs and a green energy revolution, fully fund schools from pre-K through high school, and offer free higher education at state colleges and universities. That’s enough to make our state a place where our stories would not be filled with shared tragedies, but shared hope. Too many of those in power want us to believe that people in rural areas don’t want the same fundamental things we need in urban areas: adequate healthcare, fully funded schools and dignity for seniors. The powerful want us divided. They want us to believe we have no common goals; they say we have to choose a side. They pit Democrats against Republicans, downstate against upstate, and force us to choose. They want us to pick Bruce Rauner or Michael Madigan. Hillary Clinton or Donald Trump. But as I carried my cousin’s cross across Illinois, something amazing happened. Person after person came up to talk with us along the road – black, white, latinx, and Asian; strangers, passers-by, and marchers who joined us for a while; people from rural farm areas, and people from the cities; Jews, Christians, Muslims, and Atheists. And every one of them did. As we marched together, all of these new friends helped me share the weight of my cousin’s cross. We talked about his story, and their stories, and what it is like to live and die in forgotten communities across our state that have no resources or hope. 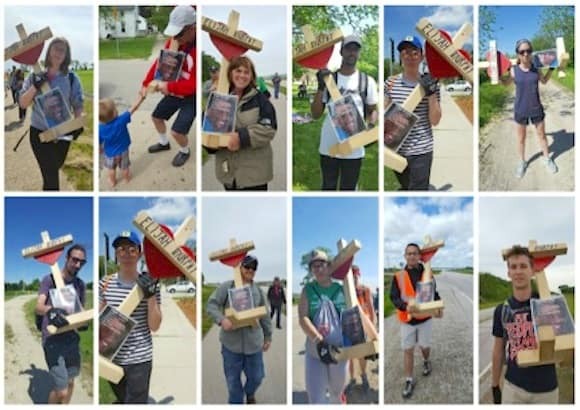 Everyone I met on our March to Springfield – all of the strong hands that rose up to hold my cousin’s cross, all the stories they shared with me on the road and in communities across Illinois, made it undeniably clear to me that we, as a people, are all on the on the same side. We share the same journey. 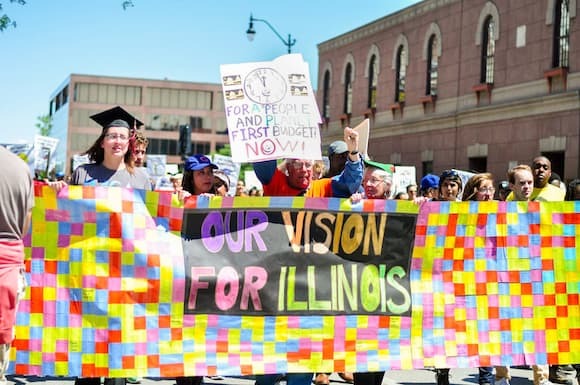 When we reached Springfield on March 30th in the historic finale to our March for a People & Planet First Budget on March 30th, we brought 500 people to the state capitol to demand that our legislators join the people in their fight for a just budget. Fifteen of our Fair Economy Illinois brothers and sisters disrupted the House session, and were violently removed. 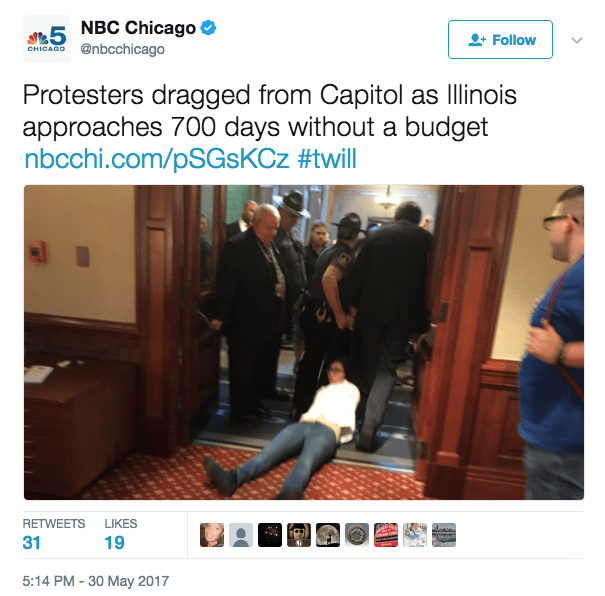 I was zip-tied together with nearly twenty leaders, in a nine-hour occupation in front of Governor Rauner’s office. As I marched with my cousin’s cross then risked arrest with 33 brave brothers and sisters, I felt the support of the hundreds of people we met along the way, who made time to walk and talk with us, and support our cause. I know now that as the people of Illinois, we can all share a vision that puts people and planet first. We are done being pitted against each other to fight over scraps. Yes, you can. You must. We elected you to help, and we will march until you do. Erica Nanton is a leader with Fair Economy Illinois and an activist organizing on the South Side of Chicago. She marched 200 miles from Chicago to Springfield to advocate for investments and human services needed by communities across Illinois. See more about her journey on the March to Springfield Facebook page. Everyone I met on our March to Springfield for a People & Planet First Budget made it clear to me we are all on the same side. We all share the same journey. It’s time for our elected officials to step up and do their share.